Harold T. Goodey, Twyford Car Dump, was fined £2 at the Wokingham Police Court for leaving a steam waggon in a dangerous position on the Eversley – Reading Road. P. C. Keene said he saw the wagon on the wrong side of the road drawing water. Beyond the wagon a man was lying injured in the road and a motor-car was in the ditch on the off-side of the road. The car had been travelling in the opposite direction to the wagon and had struck the near side wing of the vehicle. The driver was knocked unconscious and had fallen out of the car which had run into the ditch. Car’s crash into Steam Wagon. Engine Taking Water from Stream. Stated to have received serious injuries when his car collided with the side of a steam wagon, Andrew Thomas Andrews, a commercial traveller (32) of 46 Somerset Road, South Farnborough, Hants., died in the Royal Berkshire Hospital, Reading. The inquest was held at Reading Coroner’s Court on Saturday morning before Mr. J. L. Martin, the Reading borough coroner, who sat with a jury. Mr. J. A. Brain appeared for the employers of Andrews, and Mr. E. D. Berry for the driver. P. C. Keene, of Arborfield, said he arrived at the scene of the accident, which had taken place a little on the Reading side of the Remount Depot on the Reading – Eversley Road. A steam wagon was on the off side of the road facing Eversley for the purpose of taking water from a stream which ran under the road. In reply to the coroner, the officer said that the driver could have taken it on the other side just as well. Marks on the road showed that the car, after striking the wagon, ran along for a distance of 173 feet, mounted the grass verge for 47 feet, regained the road and threw the driver out, after travelling for 38 more feet. Here he found a pool of blood. From here the marks showed that the car went on for 173 yards and then ran into the ditch. The man was taken to the Royal Berkshire Hospital, Reading. The car was a Morris touring car. Certain proceedings were taken against the driver of the steam wagon for being on that side of the road. The near-side of the rear wing was bent, and the off-side of the car was wrecked. In reply to the coroner, witness said that he had never seen wagons taking water from that spot. The wagon had been unloading pipes on that side of the road, about 100 yards down the road. The driver, Harold Thomas Goodey, a steam wagon driver and owner, of 89 Cholmeley Road, Reading, said on November 9th he had been carrying water pipes and dropping them on the side of the road as he went along. This caused him to use more water than usual, and at about 4:55 p.m., he stopped to pick up at the spot. As there was insufficient on the near-side, he went over to the off-side to pick up. Witness was standing in front of the engine when he saw a car approaching about 200 yards away. It was driven at a fast pace, and he heard the car hit the wing of the wagon. It then carried on for about 50 yards, when the driver fell out. It was between the lights. The side lights of the car were on, but he did not see a head light switched on. He (witness) disagreed with the constable with regard to the quantity of water on the other side of the road. He looked at the stream and decided there would not be enough. The constable re-called, said on the near-side the stream was joined by two others. The driver’s brother, Eric Goodey of the same address, also gave evidence. He said he was standing on the grass verge and could see both ways. The car had very poor lights and he estimated the speed at about 35 to 45 miles an hour. Mr. Brain: I suggest to you that you dropped the last lot of pipes on the off-side and then went on the same side and filled with water. Witness said the car was on them in an instant. Mr. Brain: Do you mean to tell us that it was only the matter of a moment from the time you saw the car 400 yards away, until it passed you? Mr. Brain: It must have been travelling at a speed. The jury, after a retirement of nearly half an hour, returned a verdict of “Accidental death” and expressed their opinion that the accident was brought about by an error of judgment on the part of the driver of the car in passing the vehicle. The coroner, jury and Mr. Brain, on behalf of the driver, expressed their sympathy with the relatives. The news item doesn't specify the type of steam wagon, but it mentions that the vehicle had rear wings, so it probably looked like a conventional lorry as shown below. 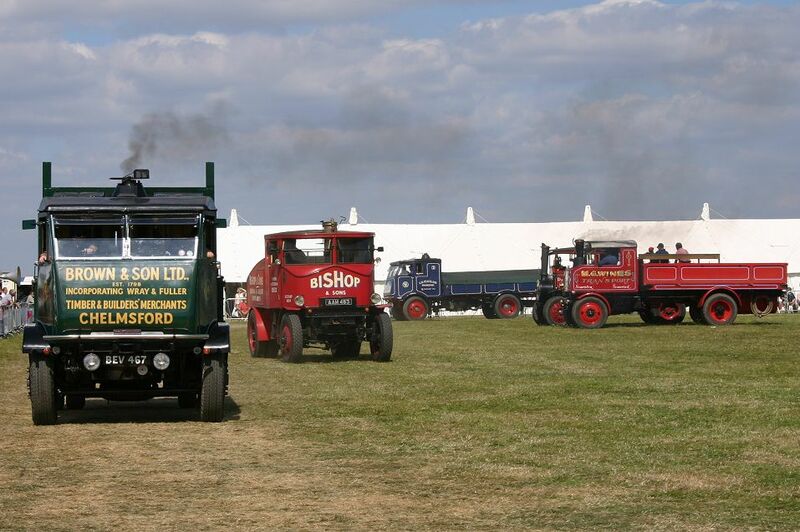 We are grateful to Paul Sharpe for permission to use this photograph of a selection of steam wagons and lorries taken at the Kemble rally in August 2005. In the late 1960's the Garrison By-Pass replaced the old Eversley Road from Ducks Nest Farm southwards to just past Westwood Farm. 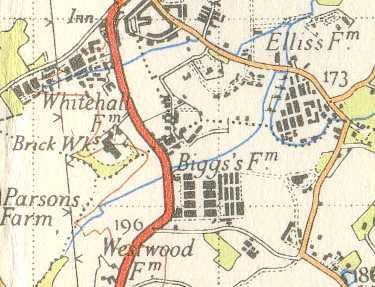 The first stretch of the old road became Rickman Close, then south of Langley Common Road it became Bramshill Close, with a pedestrian-only stretch to Baird Road. South of this point is now known as Sheerlands Road.